The Adoration Ministry Enugu, Nigeria, on Saturday alleged of an assassination attempt against its director, Rev. Fr. Ejike Mbaka. This is coming amidst controversies generated by Mbaka’s message last Sunday, which has attracted wide criticisms, including from the Catholic Bishops of Nigeria. In a statement signed by Chief Aka Emmanuel, President, National Adoration Family, Chief Okolo Godwin, President, Adoration Fathers’ Associations World Wide, Mrs Ann Aligwe,-President, Adoration Mothers’ Association World Wide, Chukwu Agoziem, President, Adoration Youths’ Association World Wide and Barr Ike Maximus Ugwuoke- Media Chief, they said Fr. Mbaka was shot in Emene, near Enugu, the State capital. The statement made available to DAILY POST read: “It is with rude shock and utter surprise that we received the report of the attempted assassination plot of the Spiritual Director of Adoration Ministry Enugu Nigeria last made Thursday evening by some unknown gunmen who fired gun shots at him on his way along Emene road Enugu. “This incident has added to several other assassination plots targeted at Fr Mbaka since after the first plot that was carried out on him on his way from the Bishop’s house where he had gone to answer an impromptu call by his Bishop during the regime of Governor Chimaroke Nnamani of Enugu State . “This assassination plot against Fr Mbaka is coming barely few days after the 2018 Harvest and Bazaar of the Ministry whereat Fr Mbaka had come under massive media attack for asking Peter Obi, the PDP Vice Presidential Candidate for the 2019 General election who attended the Bazaar programme, to make public his support or donation for the Church Project of the Ministry. “Many Supporters of Peter Obi and even clergies have misconstrued this as embarrassing to Peter Obi and to the Catholic Church and this has consequently given rise to the statement issued by the Catholic Bishops Conference of Nigeria (CBCN) that same Thursday on the issue. The issue had lingered in spite of the apology, which Fr Mbaka in his characteristic humility had tendered at the altar to Peter Obi and anyone who may have been in any way form and kind been offended at the Bazaar event. 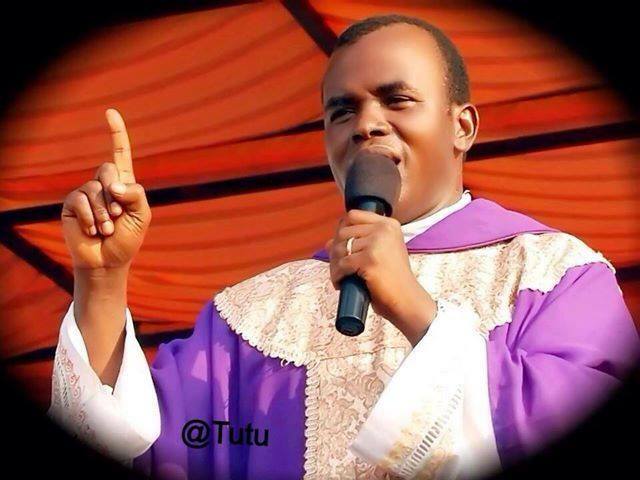 “We have refrained from making any official statement on the ongoing media attack against Fr Mbaka over the Baazar incident because he had held us from joining issues with the Church Clergies and hierarchies on the subject, but we cannot continue to keep silent especially now that the issue is taking the dimension of plot to exterminate his life. “We recall that the last time Fr Mbaka raised alarm over threat to exterminate him was in early 2015 when he faced a similar persecution by some church hierarchy and the PDP Government following his 31st December Prophecy of the imminent defeat of former President Goodluck Jonathan led PDP Government by President Mohammadu Buhari at the 2015 General Election. “Today, with the 2019 general election around the corner, it appears that history is repeating itself. The contemporaneousness of the recent attack of Fr Mbaka by gunmen with the Peter Obi and the CBCN saga leaves us to a safe conclusion that the attack on Fr Mbaka may have either been politically engineered or ecumenically endorsed, and thus we will not hesitate to call on the security agencies in this country to beam their searchlights and leave no stone unturned in getting to the root of this issue. “Fr Mbaka’s life means so much to us and many poor and voiceless Nigerians for whom he lives and so we cannot be silent on the face of any threat to his life real or perceived. The graphic narration of the sinister assassination plot as recounted by Fr Mbaka himself during the last Friday’s all night Adoration vigil should not be taken lightly and we charge the security agencies in this country to arise to the situation. “We continue to thank God for His continuous miraculous protection of Fr Mbaka and for His Special Supernatural Security (SSS) of Fr Mbaka and the Adoration Ministry. We are by this medium sending a strong warning to wherever the assassination plot against Fr Mbaka is coming from, be it the politicians or their supporters or the Church that we shall not fold our hands and keep watching. We shall not only expose the source of this threat to the life of Fr Mbaka at the fullness of our investigations but we shall also match same with equal force in self defence.